Have you ever considered purchasing estate jewelry rather than contemporary pieces? Before you make a purchase, it is important to think about the possibility of adding more unique pieces to your jewelry box. As a matter of fact, if you have been collecting jewelry for years but never really stopped to consider estate jewelry, you are missing a LOT. If you are wondering what exactly estate jewelry is, these are finely-crafted jewelry pieces that have been owned previously. When you shop at Gray and Sons, you will be able to check the entire estate jewelry collection and become so awe-struck you may not want to shop anywhere else. When you buy estate jewelry, you not only add a few one-of-a-kind, unique pieces to your collection, you also have the possibility of taking advantage of a few great deals. Here are 8 estate jewelry advantages to consider. In all likelihood, jewelry pieces you will find at an estate sale are going to be one-of-a-kind or hard to duplicate. This is because these are no longer mass produced and you will most likely be the only one wearing stunning jewelry pieces at the next office cocktail party when you buy from an estate sale. An estate jewelry collection is a great way to get in touch with history and to become more familiar with various eras. There are various eras in history that produced specific jewelry designs. This included time periods such as Art Deco, Edwardian, Art Nouveau, Retro or Victorian. What better way to learn about history than with a walk down the estate jewelry lane? Estate jewelry features designs that suit everyone’s budget, occasion and mood. As a matter of fact, you may be left awestruck once you check out all the available estate jewelry designs available at Gray and Sons. The bottom line is, you just don’t see finely-crafted jewelry made this way any longer. Serious collectors may search for jewelry from specific eras. If this applies to you, an estate jewelry collection may have what you need. Where else will you find jewelry from the Art Nouveau period or Victorian era pieces? Antique jewelry collections usually feature various gemstones that fascinate and impress. Get bewitched by the red rubies, the deep emerald greens and the unique sparkle of a diamond in antique settings that set off these stones perfectly. These days, when gemstones are what you are looking for, a more modern collection might not have what you seek. Rather, an estate jewelry sale is what you need to check out. Specific designers such as Lalique, Tiffany and Cartier have been making jewelry for centuries. At an estate jewelry sale, you may find pieces created by these top quality designers without the hefty price tag. This is a great way to invest in designer estate jewelry, not to mention being able to get a firsthand look at the great pieces that will look great in your own personal collection. Since quality pieces tend to go up in value, estate jewelry pieces that are nothing short of magnificent may be handed down from one generation to the next without anyone realizing what a great investment they are. Antique jewelry not only looks great, but increases in value as the years go by. You don’t have to travel halfway across the globe just to check out estate jewelry. All you need to do is to browse through the Gray and Sons website and voila—an array of authentic estate jewelry for you to choose from. Whether you are looking for various ornate antique pieces such as brooches, lockets, rings, watches or even rings in Jupiter, Gray and Sons can provide you with what you need. As a matter of fact this is true whether you are buying or selling estate jewelry in the area. To be able to acquire the most precious, pre-owned antique pieces from various eras, check out the pre-selected selection of Gray and Sons estate jewelry. Rated by Coastal Living Magazine as the ninth happiest American town by the seaside in 2012, Jupiter is located in Palm Beach County, Florida. This is one of the most northern suburbs in the metropolitan area of Miami. Aside from the Jupiter Inlet Lighthouse landmark in the area, which is its most notable symbol, this is a great location for those who enjoy the sea, the sand and the surf. 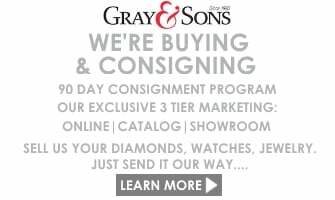 It is in Gray and Sons Jupiter where you will be able to buy and sell estate jewelry pieces to either add or let go of some of your older pieces. This gives you a lot of options in terms of growing your collections or finding great value for money for your own personal pieces. 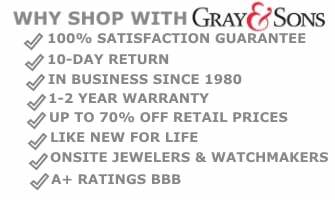 Having been in this business for years, Gray and Sons are a reliable, verifiable and dependable source for getting certified by an experienced gemologist. For stunning estate jewelry pieces, there is no other place in Jupiter as reliable as Gray and Sons. This is true whether you have decided to let go of some of your precious jewelry pieces or if you have decided that now is the perfect time to add to your collection. The most important consideration is to make sure that you get the right appraisal for your jewelry by a certified gemologist. While in Florida, you might want to consider getting a few of your pieces appraised. At Gray and Sons, you can be assured of the right appraisal for your pieces. Leave nothing to guess work and make sure that your pieces are valued correctly. After all, in this day and age, going to the right place should really be worth it.